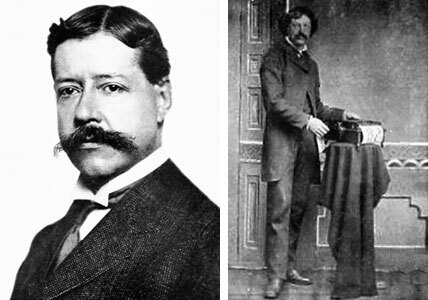 Lee Burridge (biography of Lee Burridge) and Newman Marshman (biography of Newman Marshman) were inventive geniuses and manufacturers, primarily known as typewriter inventors. In early 1890s they devised and patented two adding machines (patent US513452 for Adding Machine from 1894 and US553331 for Adding and Recording Machine from 1896). Burridge and Marshman patented also a cash register in December, 1896 (US574302), and Burridge alone obtained also a patent for cash register in 1898 (US608509). Let's examine the second adding (and recording) machine of Lee Burridge and Newman Marshman, using the patent drawing (see the lower drawing). The object of the invention is to provide a machine that will print and add figures by the operation of a stylus as exemplified in patents on typewriters granted to them in 1885 (patents 314996 and 315386), this invention being the outgrowth of that, and an adaptation of it modified to serve the purpose for which it is intended. The operation consists in moving the stylus opposite to the desired numeral on the letter-plate and depressing it, which will cause that numeral to be printed on the platen 51, and the wheel 90 (and whatever wheel (31 it is in mesh with) to rotate that particular number of teeth. When the hand and stylus return, the carriage will take one step to the right, owing to the movement of the spring-clogs 76 with rack 75, and the next depression of stylus will cause a numeral of a higher numerical order to be printed and added. When the desired number has been printed the arm 15 is drawn down, which will cause the carriage to be returned to the starting point, the spring 91 to be rewound, the paper to be advanced to a new line, and the arms 67 to be reset, it let off during the rotation of the adding-wheels 61. 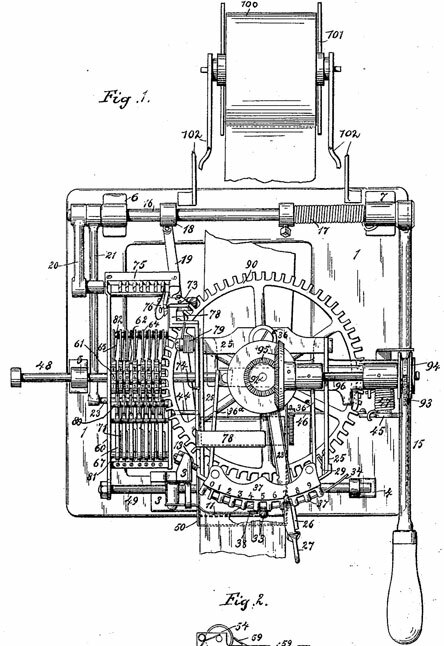 After the death of Lee Burridge in 1915, he was granted another patent for Adding and Recording Machine in 1916 (US1198820).